Harleston Village is a multifaceted neighborhood of historic downtown Charleston, with everything from quiet residential streets, restaurants and bars, to Charleston's grandest historic hotel, Colonial Lake, and the College of Charleston campus, all within its district. Stray off the tourist path and venture onto the side streets of Harleston Village for shopping, corner cafes, and a peek into student life in the city of Charleston. Don't miss visiting the College of Charleston campus during your time in the Holy City. As the 13th oldest institution of higher ed in the country and oldest South of Virginia, C of C charms visitors with its historic buildings, massive live oaks hung with Spanish moss, and old bricked pathways. The College of Charleston welcomes a small student body of about 10,000, and is located just off of King and Calhoun streets. 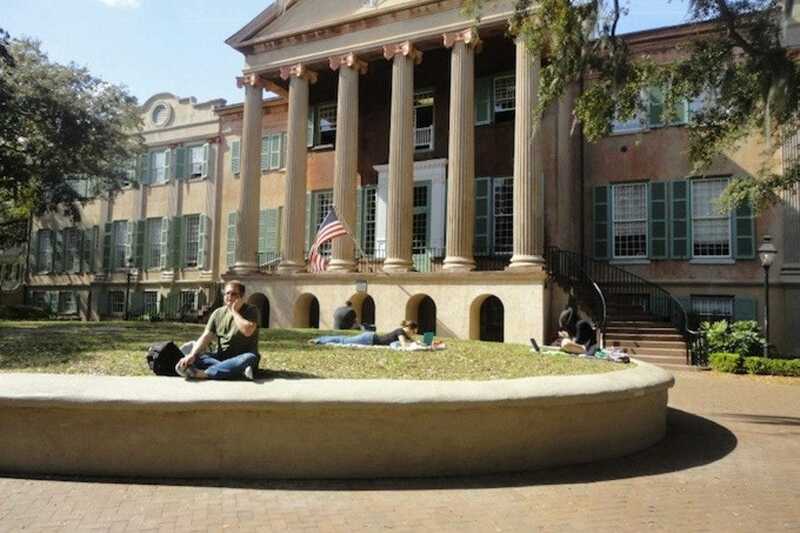 Stop by the beautiful Cistern Yard for a picnic, quick shady nap, or just to people watch and take pictures. Caviar & Bananas is a true local's favorite. This gourmet grocery and artisan cafe serves breakfast lunch and dinner, with sushi, sandwiches, soups, salads, pastas, and a full service coffee and pastry bar. The friendly staff here can also help with make your own sushi and sandwiches made with their local and imported ingredients. C & B also sells french breads, honey, jam, cheese, and ice cream, as well as a variety of beers and wine. Stop by Caviar & Bananas for your picnic supplies before heading to explore the C of C campus or the Battery. Head to Boone's Bar & Grill any day or night of the week for good food, live music and DJ tunes, and a big screen sports bar atmosphere. Very popular with students and local young people, Boone's is always a good time. Enjoy their two full bars, extensive beer, wine, and bourbon list, as well as nightly specials, Wednesday night trivia, and a beautiful second floor outdoor patio. Housed in a grand historic mansion dating back to the 1880's, Wentworth Mansion is one of Charleston's most coveted properties, and the area's only Five Diamond hotel. Enjoy a garden suite for the most luxurious stay in the Charleston area, and enjoy exquisite fine dining at Wentworth Mansion's own Circa 1886 restaurant. Here in a quiet residential area of downtown, you'll be undisturbed in your relaxing room or suite, and only a few minutes walk from all of the sights, shopping, bars and restaurants of Charleston's historic district. House of Sage is every shopper's dream boutique. Situated between King Street's shopping district and the College of Charleston campus, House of Sage carries edgy men and women's clothing, accessories, housewares, and comfy graphic tees with Charleston insider prints. Stop at House of Sage before or after lunch at C&B, and be sure to browse their extensive selection of denim.